Each Episode is considered to be a stand-alone experience. Any future Episodes will expand upon Lethe's lore and backstory, but not necessarily the same protagonist's story. Story: Lethe isn't your typical adventure game. Learning the story behind the places you'll visit, is entirely up to you. 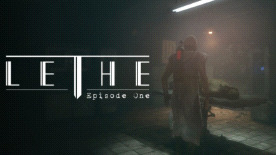 Lethe - Episode One © 2012-2016 KoukouStudios. ‘Lethe - Episode One’, KoukouStudios and related logos are registered trademarks or trademarks of KoukouStudios. Faber Interactive and related logos are registered trademarks or trademarks of Faber Interactive. All other trademarks or trade names are the property of their respective owners. All Rights Reserved. Unreal Development Kit (UDK) is a registered trademark of Epic Games, Inc. Unreal Development Kit (UDK) © 2009-2016 Epic Games. All Rights Reserved. Uses Scaleform Gfx © 2013-2016 Scaleform Corporation. All Rights Reserved. Uses Bink Video. Copyright © 1997-2016 by RAD Game Tools, Inc. All Rights Reserved.